Gaspard Mermillod (22 September 1824 – 23 February 1892) was a Swiss Cardinal of the Roman Catholic Church. He served as Bishop of Lausanne and Geneva from 1883 to 1891, having previously served as Titular Bishop of Hebron. He was created a cardinal in 1890. Gaspard Mermillod was born on September 22, 1824, in Carouge, Switzerland. He was the eldest of six children of Jacques Mermillod and Mermillod (née Mégard) Mermillod, both born of farming families of a neighboring village of Bardonnex. His parents operated an inn and a bakery. Gaspard attended the minor Seminary of Saint-Louis du Mont (1837-1841) at Chambéry, France and studied philosophy and theology at the Jesuit Collège Saint-Michel (1841-1847) at Fribourg, Switzerland. In June 1847, Gaspard was ordained to the priesthood and was appointed curate in Geneva, where he established two periodicals: L'observateur Catholique and Les Annales Catholiques. In 1857, he became a parish priest and at the same time, Vicar-General of the Bishop of Lausanne for the canton of Geneva. The Church of Notre-Dame in Geneva was built by him from 1851 to 1859. Gaspard was appointed Auxiliary Bishop of the Diocese of Lausanne and Geneva and Titular Bishop of Hebron, by Pope Pius IX, on September 22, 1864. He received his episcopal consecration on the September 25, 1864. He was especially active for Catholic education, founding with Blessed Fr. Louis Brisson and Saint Léonie Aviat the Oblate Sisters of St. Francis de Sales at Troyes, for the protection of poor working girls. On October 30, 1868, Leonie with one of her former boarding school companions, received the habit of this new congregation from Bishop Mermillod. In 1873, Bishop Etienne Marilley of Lausanne and Geneva, renounced the title of the See of Geneva, in the Calvinist Canton of Geneva. With that action, the Holy See, Pius IX, appointed Bishop Gaspard as Vicar-Apostolic of Geneva, thus officially detaching the Canton of Geneva from the Diocese of Lausanne and Geneva and making it territory directly under the Papal Authority. As this was not recognized by either the State Council of Geneva or the Swiss Federal Council, Bishop Mermillod was forbidden to exercise any episcopal functions and was banished from Switzerland, by a decree of February 17, 1873. In his banishment to Ferney, in French territory, he governed his Vicariate Apostolic of Geneva, as best he could. After the Holy See condemned this banishment decree, the government responded on December 12, 1873 by expelling the papal nuncio. 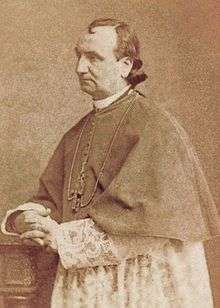 After Bishop Marilley had resigned his diocese in 1879, Monsignor Christophore Cosandey, provost at the Seminary in Fribourg, was elected Bishop to a re-unified Diocese of Lausanne and Geneva, thus the newly elected Pope Leo XIII ended the Vicariate Apostolic of Geneva. The conflict with the Canton of Geneva ended and the decree of expulsion against Mermillod was revoked. Upon the death of Bishop Cosandey in October 1882, Gaspard returned to Switzerland and was appointed Bishop of Lausanne and Geneva on March 15, 1883. The conflict was by no means at an end, for the Canton of Geneva refused to recognize him as bishop. Relations resumed as normal only when Leo XIII elevated him to Cardinal-Priest of Santi Nereo ed Achilleo on June 23, 1890. Bishop Mermillod was especially a major player in the history of the Social Doctrine of the Church. Encouraged by his friend, René de La Tour du Pin, he founded the Union of Fribourg, which included some of the biggest names in Social Catholicism of the time (Swiss: Gaspard Decurtins; French: René de La Tour du Pin, Albert de Mun, Louis Milcent, and Henri Lorin; Austrian: Karl von Vogelsang and Gustave Blome; and German: Franz Kuefstein) whose work on the "social question" form the base of the encyclical of Leo XIII, Rerum novarum. In March 1891, Cardinal Mermillod, resigned the pastoral government, of the Diocese of Lausanne and Geneva, and Monsignor Joseph Déruaz was named his successor. Upon this resignation, he relocated to Rome, where he eventually died on February 23, 1892. He was laid in repose, in the church of Ss. Vicenzo ed Anastasio a Trevi and buried in the Carthusian Chapel, Campo Verano Cemetery, Rome. His body was eventually transferred, in 1926, to the parish church of Saint-Croix in Carouge. A street, in the town of Carouge, was named in his honor. His Lettres à un Protestant sur l'autorité de l'église et le schisme (Paris, 1860) made a great impression. Another important work was his "De la vie surnaturelle dans les ames" (Lyons, 1865; Paris, 1881). His collected works were edited by Grospellier (Paris, 1893) in three volumes.